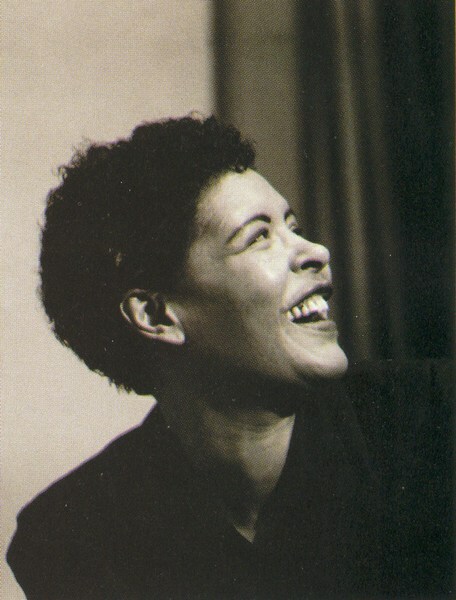 I’m glad that a number of my readers found the nearly-prurient Carl Van Vechten photographs of Billie Holiday equally disturbing. I needed to put something in their place. Erik also told me about another site devoted to Miss Holiday, a site that I find frankly astonishing — for its photographs. Most of the books devoted to Billie reproduce the same studies — often they are moody portraits with the inevitable gardenia. But Mike Lubbers of the Netherlands, the Holiday-collector behind this enterprise has found more pictures of Billie than I had imagined . 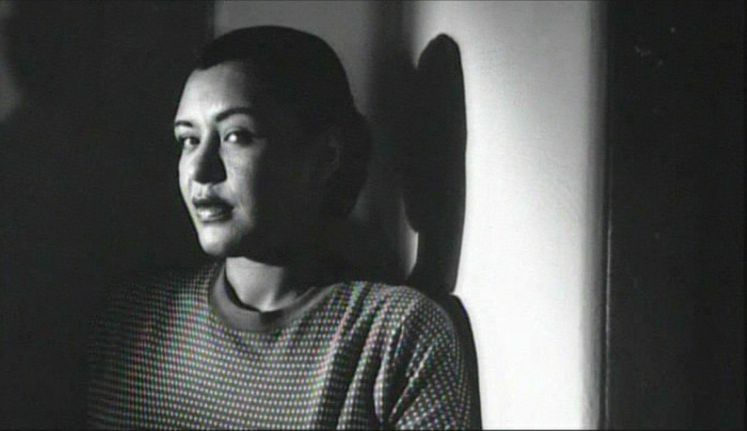 . . a few of them copies of newspaper clippings, and many of them still pictures from her appearances in SYMPHONY IN BLACK, NEW ORLEANS, film shorts and television shows. I have contented myself with only a few photographs from this site — to not seem too greedy among Mike’s treasures — but they nearly offset the Van Vechtens for me. If I have chosen a number of portraits (mostly candid) that show Billie alongside other famous musicians and singers, can you blame me? 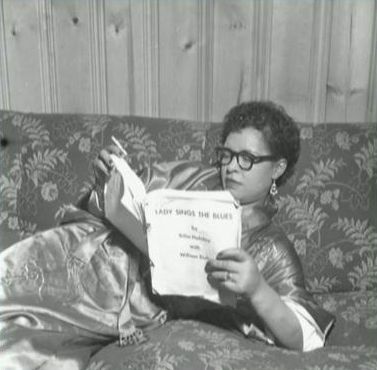 Here’s Billie the writer, presumably working on her “autobiography,” LADY SINGS THE BLUES, in June 1956. And a frankly posed shot, to make it seem as if she was earnestly blue-penciling her own galleys (or proofs?). I couldn’t ignore it because of the Fifties prop: she’s wearing horn-rimmed glasses, the sure sign of the writer, the intellectual. Editing your autobiography can’t be done without the proper plumage: in this case, sparkly dangling earrings. This somewhat grainy newspaper photograph is a relief . . . because it is in some way far more real. 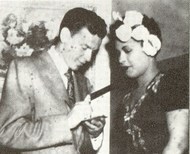 Is it that Billie has asked Frank — who said he owed so much to her singing — for his autograph? Whatever the story, this photograph was taken, or published, on May 26, 1944. 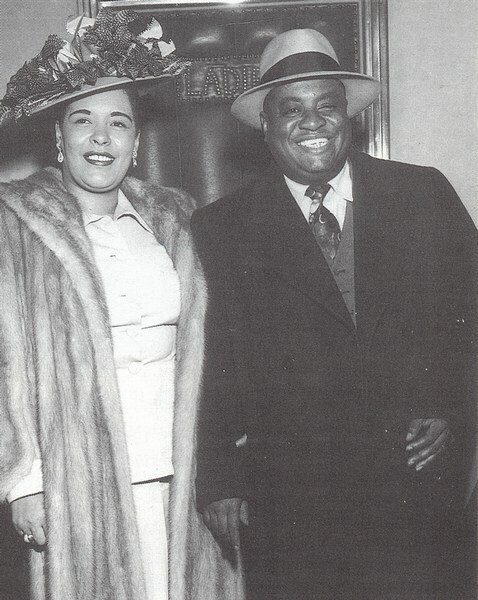 I have no fondness for any of Billie’s men, who seem to have treated her poorly, but at least she looks happy here with Louis McKay, in May 1954. A candid photograph taken at the home of Billie and Louis McKay, December 1951. If it’s caution, wariness, or skepticism in her sideways glance and slightly raised eyebrow, she looks far more relaxed, even girlish, than she ever did under Van Vechten’s gaze. 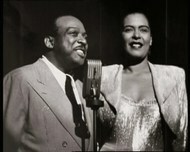 Billie with a happy Count Basie in July 1948, during their appearances at the Strand Theatre in New York City. A very hip trio in Billie’s dressing room, September 1949. Does Billie’s dog know who’s there? Of course! (Louis loved dogs.) Billie looks as if she is just about to burst into laughter — always a happy sight. 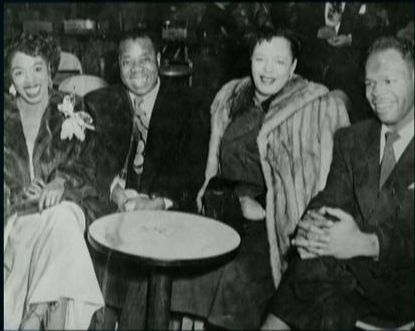 In December 1945, at the Onyx Club — from left, Sarah Vaughan (travelling in fast company), Louis, Billie, and someone whose face is vaguely familiar but elusive. At ease, even when assembled for a “candid” photograph and facing a flashbulb. 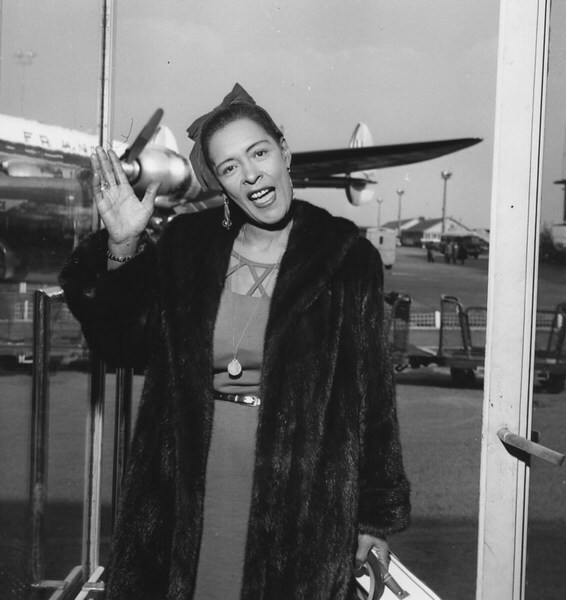 Billie at Orly Airport in Paris, November 1958. Again, it’s a posed photograph, with a good deal of failed “spontaneity” in the artificial tilt of her head and the rather forced smile — but she looks more at ease than we would have expected. 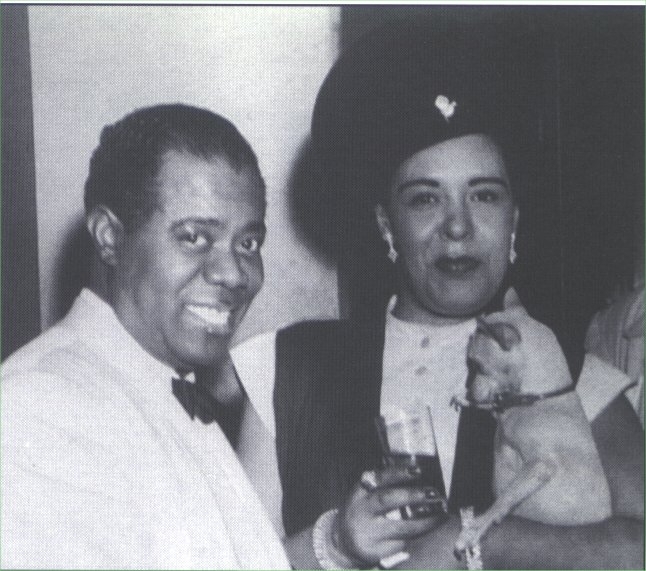 Another pianist worthy of our attention: Billie and Art Tatum, taken at the Downbeat Club in December 1946. 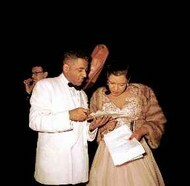 (Photographs of Tatum are rare, and I thought he and Billie were captured only at the Metropolitan Opera House jam session in 1944.) Tatum seems unfazed by the ornamentation atop Billie’s hat, and that the photographer has posed them outside of the Ladies’ — but we have to catch our legends where we may. 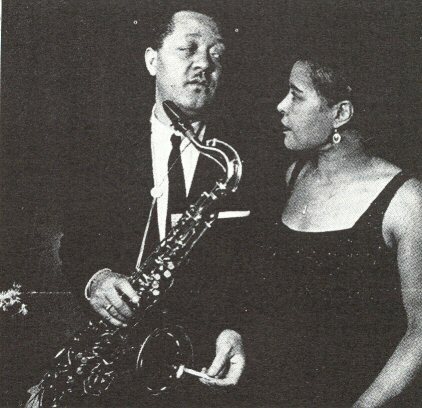 Something else I didn’t know: that Billie and Lester had appeared at a series of outdoor New York City concerts in July 1957. Lester looks dubious, Billie guarded, but I hope it’s nothing more than that they were trading bad stories about the promoter or one of the sidemen. It would break my heart if they were glaring at each other. Since Billie has often been presented as an iconic figure of sadness, of self-destruction, I thought I would conclude with two photographs where she looks unaffectedly happy, not posing at being happy for someone’s camera. If you didn’t know she was the famous “doomed” artist, would you see it in her strong, amused face? This shot was taken at a session for Verve (or Clef?) in June 1956. Late in her life — December 1958 — but taking her ease at Tony Scott’s house. 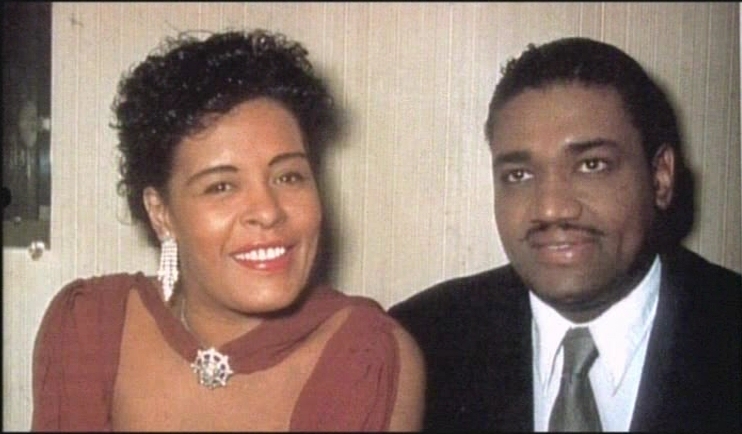 Heartfelt thanks to Erik Svindling Olsen, to Mike Lubbers, to Billie Holiday and all the people who love her and treat her properly, even fifty years after her death.